Aquatic critters that are electric, or tubular, or just plain "what the?" take the spotlight at Birch Aquarium. Aquatic critters who are electric, or tubular, or just plain "what the?" take the spotlight at Birch Aquarium. See this kid-pleaser of a show through Spring 2019. WHILE OUR DEVOTION TO THE DEEP... is as deep as the ocean itself, we landlubbers can find our interest renewed in the summertime, thanks to visits to the beach and major TV events like "Shark Week" on Discovery. We find that we have fresh eyes for incredible aquatic wonders, from toothy predators to glowing algae to the millions of other marvels that exist beneath the glittery and vast ocean surface. But a beach trip or an hour of TV doesn't always tell us all we'd like to know about the Big Water's more whimsical side, and those critters that can only be described as "quirky." 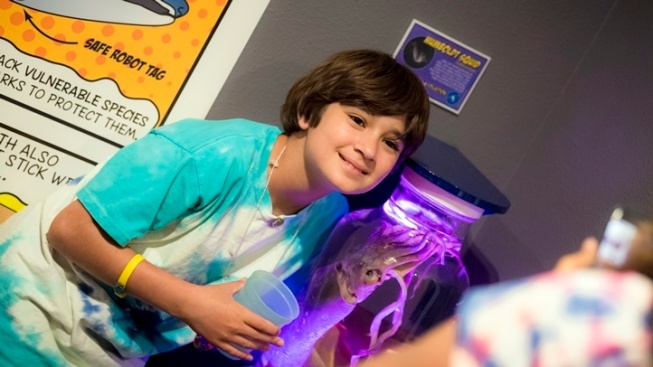 True, there are other ways to sum up the ocean's more offbeat denizens and features, and Birch Aquarium at Scripps Institution of Oceanography, UC San Diego is showing those creatures the in-depth love over the next several months. How to see these weirder mysteries of the glug-glug? A NEW EXHIBIT... called Oddities: Hidden Heroes of the Scripps Collections is now on view at the La Jolla destination through Spring 2019. What sort of wowza fishies might you encounter? Look for info on the "amazing adaptions marine creatures have developed" over the eons, from "super vision and invisibility to protective armor and the ability to create electricity to zap prey." It's an interactive exhibit, one that will focus on the science but also include forays into pop culture, as well as "medicine and engineering." And shall there be "creature cosplay"? It is, after all, an interactive exhibit, so prepare to do some testing of the creatures' "unique adaptations" while there. How to enter this odd and fascinating ocean o' info? Your admission to the Birch gives you entry to the "Oddities" exhibit, hooray.